The advent of internet has brought about a rapid change in the way online and offline marketing strategies are perceived. The most important thing to do is come up with a good balance of using these online and offline marketing strategies in such a way that it spells success for your business. The benefits of these marketing strategies are multi-fold and one can generate worthy traffic, attract customers and build up a business if the efforts are used in a proper manner. If one keeps in account the following facts while devising the marketing strategy, the online and offline endeavors will bring great results. Offline marketing endeavors are equally relevant while one talks about successfully taking any initiative forward. You can put the URL on your printed material. This will help in the promotion of the business as the customers will want to check out the performance of the enterprise at their leisure. They can simply type out the URL and get linked to your website. This works to your advantage as you will save a substantial marketing cost that would have gone to promote and channelize your efforts. People can get to know about you through the company URL, thus bringing in worthy returns for the efforts you have made. 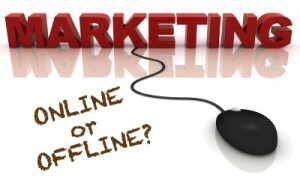 Your offline marketing endeavors can also receive a boost through social media. The young generation is especially attuned to social media websites such as Facebook and Twitter. Having a Facebook page is a viable way of attracting potential customers and you can offer them exclusive products at discounted price. This also gives a precise idea to the customers about the kind of services you are offering and you can create a large database of followers who would wish to connect with you at various forums. Mobile phones too can be used for marketing purposes. The role of QR code technology is significant in this regard. Use of these codes in offline marketing strategies can bring worthy returns for your efforts. The offline prospects can be connected to your site through these codes. QR code technology is an excellent combination of offline and online marketing strategy and can bring great results to any business endeavor, if used in a proper manner. Sending offline mailers is a great idea in case you wish to share information about your company. The respondents will be able to share information about their location, social needs, interests, etc. This will help you devise personalized marketing strategies for business promotion. Information collected through mailers will help you update your online endeavors and come up with a suitable online strategy and display the same in your website. Guest blogging is a great idea that helps in the promotion of any business. As reputed guest bloggers connect with you and share their ideas, your visibility increases multi-fold. More people will read their blogs and get to know about your endeavor, too. This converts into leads, eventually, and will bring quality business to your firm. Use offline and online endeavors creatively and you are sure to rise high and create a niche market for yourself. Brianne is a writer/blogger. She contributes to Infurn.